When you think of a mouth guard, what comes to mind? Probably several images and thought-provoking arguments for their use in decreasing concussions, right? In the last several years companies have been researching the effects a concussion has on athletes. In light of this, professional and amateur sports alike have modified their rules with concussions in mind. Even mouth guards themselves have seen improvements with new models being designed each year as we learn more about their effectiveness. However, what if concussions were not the only concern athletes had while playing sports? Imagine if you were to have some of your teeth knocked out while playing sports. Smiling, talking, eating- everything would suddenly be affected. Even your tongue can be damaged and cause serious implications for you. Mouth guards help cushion a blow to the face, minimizing the risk of broken teeth and injuries to your lips, tongue, face or jaw. They typically cover the upper teeth and are a great way to protect the soft tissues of your tongue, lips and cheek lining. “Your top teeth take the brunt of trauma because they stick out more,” says Dr. Charmoli. “Your bottom teeth are a little more protected because they are further back.” Dr. Charmoli of Jackson Family Dentistry has been practicing dentistry in Jackson for the last 27 years. He says, “When it comes to athletic gear, a mouth guard is an important piece of equipment.” This goes for not just contact sports but non-contact sports as well. Gymnastics, cheerleading, and skating are all examples of sports you typically wouldn’t think to wear any protection. However, even these activities can result in serious dental injury. When it comes to braces, mouth guards are effective and necessary. Trauma to someone’s mouth can not only break the brackets that hold the braces in place but also push them against the users’ cheek and lips causing severe cuts and tears. A mouth guard can provide a barrier between the braces and your cheek or lips, which can help to avoid or limit injuries. In light of this, here are a few things to look for when buying a mouth guard. There are three types of mouth guards: stock, boil and bite and custom. Knowing what each of these does and how they fit your mouth will help you find the right choice. Stock mouth guards are normally the least expensive option, however, they are not formable to your mouth at all and can be uncomfortable to wear. When fit properly they can be effective but will not fit everyone’s mouth the same way. 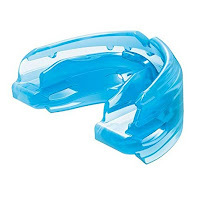 Our office recommends avoiding using these types of mouth guards whenever possible. Boil and bite mouth guards are the most common option and the option many of our patients choose. They are still relatively inexpensive and are formable to everyone’s mouth. 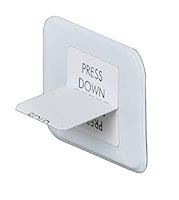 This makes them very customizable and an excellent choice for many people. The biggest drawback to these types of products is the individual is forming the mouth guard to their own teeth. This can sometimes be cumbersome and if the impression is a little off then the teeth will be less protected. The third and final option is a custom mouth guard. Custom mouth guards can be made either at your dental office or through an online provider. These will be your most expensive option because an impression is taken of your mouth to ensure a proper and ultra-custom fit. They also last longer and are more comfortable to wear because they fit higher on the gum line and do not fall down as easily as the others do. If you are looking for a mouth guard talk to your dentist about the different options you have available. Mouth guards are essential to your dental health and your dentist will be able to answer any questions you may have.